On 9 October 2013, many news bulletins and articles relayed the news that Akong Rinpoché had been murdered in Chengdu, China, by three people. Certain articles mention that Akong Rinpoché is a very high-ranking Kagyu lineage lama as recognized by the late 16th Gyalwa Karmapa, Rangjung Rigpé Dorjé. We, the legal office of Rumtek Monastery, would like to clarify this last point, i.e. the origin of Akong Rinpoché’s title. In the well-documented history of the Karma Kagyu lineage, there were no Akong Rinpochés, neither scholars nor meditators, previous to the present one. According to information provided by the late 16th Karmapa’s attendants, there was a village in Kham, eastern Tibet, that depended on Palpung Monastery. In the village was a temple, Drölma Lhakang, that had been developed by a ngakpa who was known for his mastery of black magic. It was even said that he had used his powers to kill opponents of this village. It seems that the ngakpa’s name was Akong Lama. Although he used black magic, he was well appreciated and highly respected by the villagers, and after he died they asked the 11th Situpa, Pema Wangchok, to recognize his reincarnation. In order to satisfy the villagers, the 11th Situ rinpoche recognized one of the village children who then became known as Akong Tulku. When he was a young boy, his family decided that he would be a monk. Around that time, Chögyam Trungpa Rinpoché was giving a major empowerment at Surmang Monastery in Xinghai province. Akong Tulku attended the empowerment and served there as Trungpa Rinpoché’s attendant. In 1959 when Tibetan lamas escaped Communist rule in Tibet and fled to India, young Akong Tulku served as Trungpa Rinpoché’s assistant. In 1963, when Trungpa Rinpoché went to Great Britain, Akong Tulku accompanied him and was there when Trungpa Rinpoché founded Samye Ling in Eskdalemuir, Scotland. In 1971 Trungpa Rinpoché was injured in a motor accident that left him partially paralyzed for a time. Following this period, Trungpa Rinpoché and Akong Tulku no longer got along. Trungpa Rinpoché left the UK for the US with the help of his consort, Diana. Akong Tulku was then left in charge of the Samye Ling centre. In 1974 Akong met the H. H. the 16th Karmapa and asked him for a title in order to inspire confidence in his in-charge and to facilitate success in the construction of the centre and monastery in Scotland. The Karmapa gave him the ‘Chöjé Lama’ title, a traditional title that the Karmapa often gave to lamas who had completed a three-year retreat and then travelled to different places in order to spread the BuddhaDharma. Under the direction of Akong Tulku, who was a lay lama, Samye ling developed into a large and active monastery and Dharma centre. 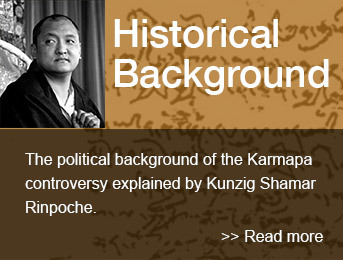 Akong Tulku said that Gyalwa Karmapa had, in fact, given him a long name and title following the request, but no record of this has been found to date in the late Karmapa’s journal or in any of the usual documents.